Playing along at Paper Smooches, yet this card will then go to a special someone who supported me in the Relay for Life walk that I took a couple of weeks ago. It's Anything Goes at Paper Smooches this week...YAY! I love this embossing folder by Darice. 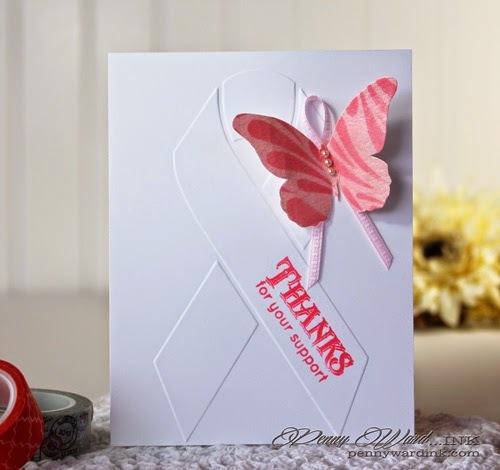 It is not just specific to Breast Cancer, so you could decorate it in any color or style according to your recipient. 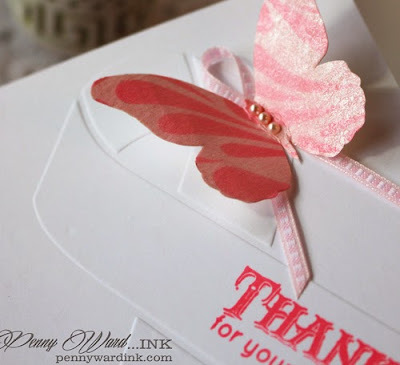 I stamped the butterfly in Memento Angel Pink, then using a stencil I eBrushed it with a Copic marker. Butterfly was spritzed with Sheer Shimmer Sparkle and ribbon was tucked behind it. Using the Misti made it super easy to stamp this sentiment with two different stamps. Another masterpiece! Your head is just full of great designs .. love this! Love this - this is a super card that just screams - PENNY made me!! So crisp and clean and love the touch of hope with that beautiful butterfly! !